So many things could be done with a ‘dark’ challenge. My first thought was galaxy nails, but since that is its own separate challenge later on down the line, I thought maybe I would put Orly Glowstick to work again and make firefly nails. 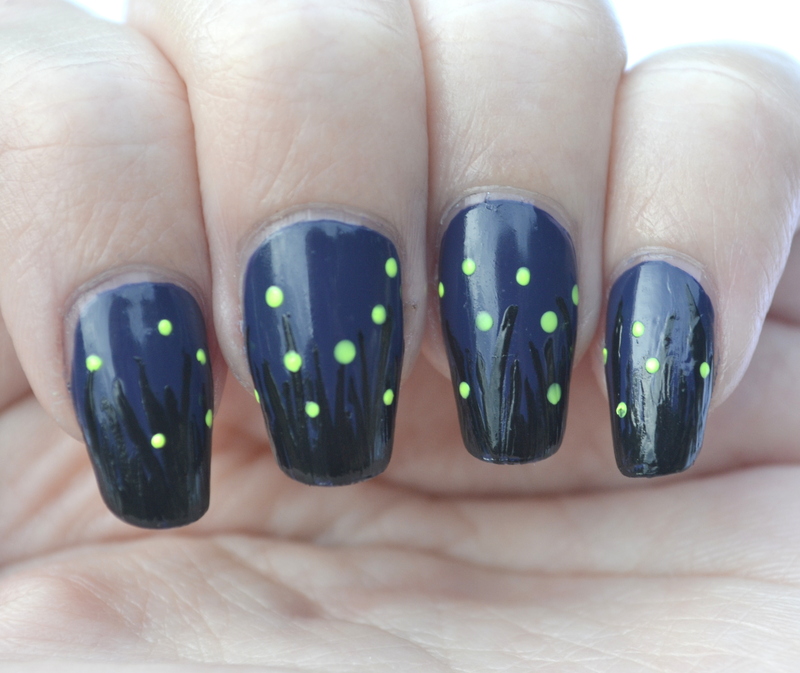 So I painted a nighttime background of Zoya Sailor and made my grassy silhouettes with Kleancolor Black. Then I used a toothpick to make my fireflies with Glowstick. To create a better firefly effect, I added a glow-in-the-dark top coat to the dots, but even though it’s pretty visible in person, it didn’t show up on any of the cameras I tried. Too bad. This is still undoubtedly a cute nail art. I’m glad that I added the grass to make more of a scene, instead of just throwing the dots onto a blue or black background. I think it brings the whole look together. Next up on the challenge list is ‘duochrome.’ Yay. Immediately had to come seek out your nail art after your comment! I think these are so cute, and the idea to use glow in the dark polish is brilliant! Really awesome work! Thank you so much! I really appreciate the positive feedback!